As we wind down 2015 and head into a brand-new year, I wanted to tell you about Float’s big news and our upcoming transformation. 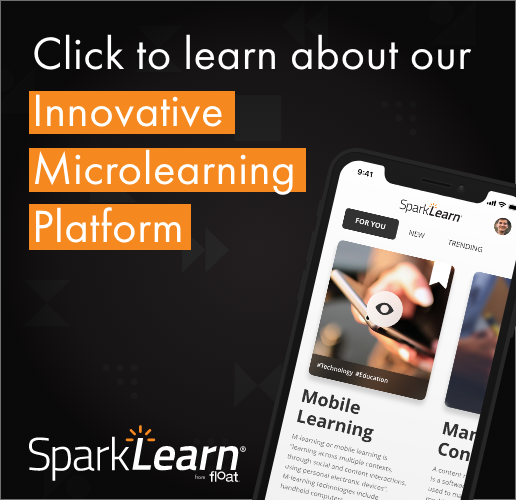 The big news (at least from our perspective): Float Mobile Learning has become Float. As Float’s managing director, I’d like to share a bit more about our new name and look, and what that will mean for you as a Float client or a subscriber to our content. First, what won’t change. We will continue to provide our clients with our very best thinking, our insight, and we will continue to deliver superior work. Float is also highlighting key areas of focus, including human-centered design, surveying and testing, and user-focused activities to create a superb user experience. This will allow us to help employees within high-performing organizations be more effective via our mobile products and digital strategies. Second, to coincide with this shift, Float has a new look. Of course, this brings a new logo (as seen above) and new website (https://gowithfloat.com). Gone are the pencil sketches and back-of-napkin ideation motif. What has emerged is an evolved, contemporary approach to the underlying principles that have always made Float great – deep expertise, strong experience, and a commitment to outstanding customer service. Third, our editorial calendar will undergo some changes, as well. To start out, we have a number of new white papers we’ll be releasing starting today and extending well into 2016. We’re excited to bring a full slate of insightful and thought-provoking content to you. 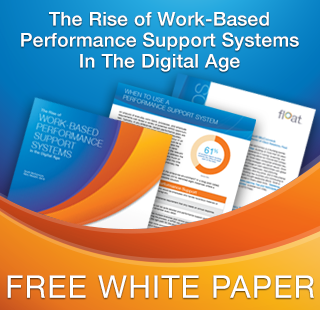 The first paper covers work-based performance support systems, written by our own Scott McCormick and Dr. Gary Woodill (download now). Other topics for 2016 will include human-centered design, gathering enterprise mobility requirements, taking advantage of advanced mobile device features, and much more. Additionally, our blog will soon showcase exclusive content from Float’s mobile experts, as well as from leaders positioned throughout the industry. These pieces will feature relevant add-ons to our white papers (a “director’s cut,” if you will), plus more on emerging trends within mobile and the enterprise. In conclusion, a heartfelt thank you for your continued support of Float. Please know that it is because of our clients – and the work that you entrust to us – that we always strive to get better in order to better serve you. We hope the new year is full of positive changes for you as it is certain to be for us.